efficient and environmentally friendly semiconductor solutions technologies. impact on our employees, suppliers, customers and communities. Learn more about our involvement in the community and global corporate giving grant program. In 2018, ON Semiconductor was named to the North America Dow Jones Sustainability Index (DJSI). The DJSI, calculated jointly by Standard & Poor’s Dow Jones Indices and RobecoSAM evaluates companies for their excellent sustainability practices through an assessment and criteria on corporate governance, customer relations, environmental policy, working conditions and social initiatives. In October 2017, ON Semiconductor completed its fourth EcoVadis Assessment to evaluate the company’s CSR initiatives. ON Semiconductor achieved an overall score of 85 out of 100, giving the company a gold rating. The score signifies ON Semiconductor’s structure and proactive approach to CSR; engagements, policies and tangible actions on issues with detailed implementation information; comprehensive CSR reporting on actions and key performance indicators; and innovative practices and external recognition. ON Semiconductor was named World’s Most Ethical Company® in 2016, 2017 and 2018 by the Ethisphere Institute, a global leader in defining and advancing the standards of ethical business practices. Ethisphere and the World’s Most Ethical Companies designation recognize organizations that align principle with action by working tirelessly to make integrity part of their corporate DNA. 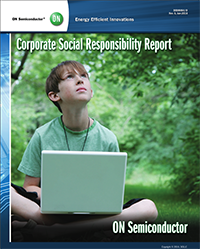 Learn more about ON Semiconductor’s designation as a World’s Most Ethical Company. ON Semiconductor was awarded Celestica’s Total Cost of Ownership (TCOO) Supplier Award and recognized as an honoree for the Best Sustainability Partner Award in 2017. The TCOOO Supplier Awards recognize suppliers that provide the best TCOO performance to Celestica and support the company’s overall business objectives while looking at quality, delivery, price, flexibility, innovation and technology. We are a performance based company committed to profitable growth, world-class operating results,benchmark quality and delivery of superior customer and shareholder value. We treat each other with dignity and respect. We share information and encourage different views in an open and honest environment. We draw out the best in each other, recognizing that diversity of backgrounds and experience are key strengths. We all win when we support each other. We mean what we say and say what we mean. Our company has set high standards for our products and individual conduct. Our reputation depends on the highest standards of ethical behavior. We are accountable for delivering our commitments on time with highest quality. We address issues objectively, using facts and constructive feedback in a work atmosphere where we do not fear open discussion or questions. When a decision has been made, we work to support it. We comply with all legal requirements and hold ourselves to the highest standards of ethical conduct. We value people who demonstrate a positive, "can-do" attitude, while collaborating to win. We work intelligently, with a sense of urgency, while always maintaining our commitment to comply with applicable laws, regulations and standards. If a problem exists, we see it through to rapid resolution while acting in an ethical manner. ON Semiconductor is dedicated to maintaining high ethical business standards with our employees, customers and other stakeholders. In living up to ON Semiconductor’s core values, we constantly encourage all employees and other stakeholders to lead by example. The actions of every employee should reflect an individual and collective effort to create an ethical work environment for our co-workers and business partners. More information on governance at ON Semiconductor and our Code of Business conduct. If you have a compliance and ethics concern, you may report it anonymously by going to hotline.onsemi.com.